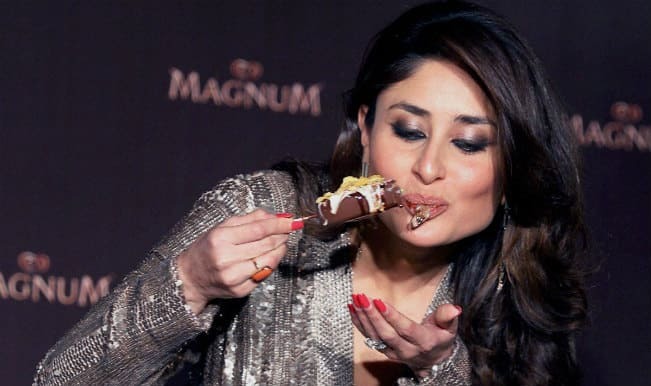 Magnum ice cream has made the bubbly and charming Kareena Kapoor Khan as their brand ambassador. If you’re a crazy fan of ice cream, you would remember the completely English ad of the Magnum ice creams that came out about a year ago. Lunched in 1989, Magnum is the first hand held ice cream targeted as a premium ice cream for adults. It’s one of the world’s leading ice cream brands and has recently entered the Indian market. This internationally acclaimed brand of ice cream was majorly available in the US. While Indians are all excited to try Magnum’s delicious desserts, the company is leaving no stone unturned in promoting their brand before the grand launch. The company has made the bubbly and charming Kareena Kapoor Khan as their brand ambassador. She was recently spotted posing for the cameras in a beautiful shimmery dress by Cue and jewelry by Isharya. The actress already has a long list of endorsements in her kettle; however she revealed at the launch that Magnum ice cream adds a great value as she has been a fan of the brand since the age of 16. Magnum ice cream was lunched in Mumbai and will be available in various flavors in Mumbai, Bangaluru and Hyderabad from March 1.